So, you’ve taken time refining your web store and reducing your customer drop-off rate. You’ve got an automatic emailer configured to catch customers who do abandon their carts. Your products are listed on Google Shopping and you have a team monitoring your feed and optimising it for best results. Your product listings have been tweaked and cleaned for better performance. Some of your marketing budget is specifically set aside to draw competitors’ customers to you. Some goes to catch potential customers before they even know your product is something they want. You’ve done everything you can to help capture new customers and drive sales from them. But what do you do to keep them coming back? A study by Bain & Company is clear: increase customer retention by 5% and you increase profitability by up to 75%. New customers can help your business survive, but return customers make it thrive. Despite this, businesses often put far more effort into making new customers than bringing others back. Here are some tactics you should at least consider. Over half of the customers who feel a strong connection to a brand say that it’s shared values which builds that connection. A company which works to support its local community or shows strong engagement with a cause and related charities can build that connection more easily. There’s a strong case to be made that the US fast food chain Wendy’s has the best social media marketing team out there. Stories of their latest stunt reach beyond the chain’s own reach, and almost always receive a strong positive reaction. But the secret to their success is that their social media promotes a single specific personality, one that resonates with their target market. Last year they even dropped a ‘mixtape’ on Spotify and Apple Music to add that extra layer of connection. We’re not just talking about giving them a product they want. If you can improve a customer’s life, they’ll feel invested. For return customers, that adds to the investment they’ve already made. Getting another buy-in is easier. A mailing list with new product announcements, a helpful YouTube video series, or a series of useful articles – they all help build that connection. Ongoing, hassle-free customer support also helps – we’ve spent a lot of time building and training our support team. We’ve all heard the old story about the mechanic who gives double the time the job will take as an estimate so he looks great when he finishes ‘ahead of time’. In today’s online world, you’re not competing against your own advertised shipping speed but against the actual speed of your competitors. The core principle still works, though – any time you can beat your customer’s expectations, you improve the chances of a return customer. A hobby supplier includes a free high-quality teabag in every order. A T-shirt company catering to a young, geeky audience runs a ‘loyaltee’ promotion card and includes small Haribo bags in their shipments. Some businesses set up auto-emails to underline to the customer that their order is important and is being handled immediately. Have you ever ordered a product on a Sunday and been delighted to see a shipping notification just a couple of hours later? Neither the hobby supplier nor the shirt store above actually mention their ‘extras’ in the packet. For first-time customers, they’re a pleasant surprise. We fix memories of surprises in our minds more firmly, so a pleasant surprise gives your customer an immediate positive to hang on to. Just as we remember surprises, we remember times that a company solved our problem without hassle. Obviously, you want to get it right first time, but treat every customer service incident as an opportunity to create a happy, returning customer. Most of the time, it is. Loyalty cards work for a reason. Online sales can use the same effect, tracked in your CRM. If there’s a way for you to offer a freebie every X sales, whether that’s a free product or even a custom, branded low-cost item you can’t get any other way, it could be worth trialling. Loyalty programs work best when you show the customer the first step on their progress meter the moment they sign up. In store, the moment that sells those collector cards is the moment you stamp the first box for them. Are you a ‘gold’ member with any company you use? These VIP memberships can be low-cost, with few extra benefits to the customer, and still give you a retention benefit. If you set up a VIP program like this, consider adding layers. Gold members are more active when there are also silver members, and silver members may return faster just to get to gold. 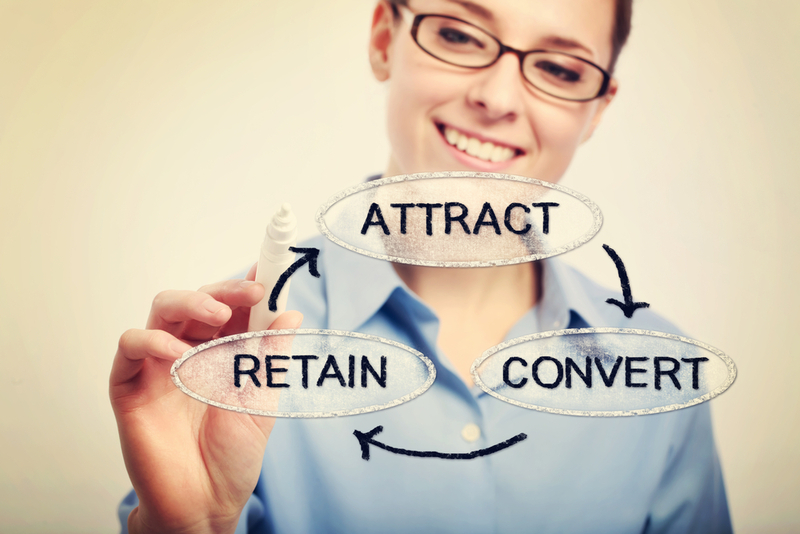 So far, we’ve only looked at steps that make customers more likely to come back. But there’s another option; keep them from leaving. If you have a good CRM, you’ll be able to notice if a steady customer starts ordering less and less often. This might be a sign that they’re dissatisfied, or even that a competitor is just offering a more attractive option. The right follow-up email at a time like that can potentially bring them back on board. It might be that a one-time discount is needed, but you could also alert them to a current promotion they’re likely to be interested in. Or perhaps you’ve launched a new product doing well among customers with similar order histories? Reaching out to your customer shows them you care. Reaching out with a personalised message based on the information in your CRM is even more effective. Old-school email marketing was little better than spam. (Some of it probably was spam, truth be told.) Modern mailing list tools offer you much more flexibility. You can segment your mailing list by who hasn’t opened an email in six months (see the dissatisfaction question above – this segment helps you target a whole range of customers like that at once). Or how about targeting customers with high email open rates (the most active, interested customers – who should be easiest to convert again)? Segmenting by age lets you target student customers during the summer ‘back to school’ season if you have appropriate products. And you can follow that up a week or two later by targeting their parents. If you’re marketing to businesses, contacting them ahead of legislation changes that might affect them gets them thinking about you. If you have a product that will help, so much the better. The key to this is that you’re focusing on a specific section of your customer base, without risking annoying other sections. When you sell high-price, high-value products, your biggest enemy in customer retention is buyer’s remorse. Sometimes, even when a customer was absolutely sure they did the right thing when they placed the order, they’re having second thoughts before the invoice arrives. This is a job for either your sales or customer service team. It’s important to understand why your customer might get cold feet. Your team should be prepared to emphasise ease of use, reliability, return on investment. Whatever the issue it is, your team should be able to address it and play up the reasons to overcome these concerns.